They loaded up their autopilot all-weather RV with luxury bedroom, bathroom, kitchen, solar-powered silent generators, next-generation ceramic-lined stainless steel smart pellet cooker and their robotic personal assistant/pitmaster, Roboerta (pronounced “Roberta”), with their robotic pets, Emilee the kitten and Mikey the puppy. After setting up camp in Wiseman Park on Friday morning, they socialized with old friends, met new friends, shared responsible quantities of the local product, and joked about who got the X-factor Magic Hickory Nut this year to win GC. At midnight the curtains around D-T B-Q’s cooking area were closed. Roboerta emerged from her secret closet and went to work, prepping each contest category in sequence while Emilee and Mikey stood guard. At the sound of a loud meow and bark, Roboerta would retreat to her closet until any uninvited visitors walked away. To Donna and Teddy’s relief there were no visitors after midnight, thus affording them a blissful night of cuddly deep sleep on a perfect fall night in the Lynchburg hollow while Roboerta applied her Artificial General Intelligence (AGI) to the tasks at hand. D-T B-Q got so many category calls at the Saturday night awards ceremony that no one was surprised when they got the final call: Grand Champion! Although the contest rules didn’t prohibit use of robotic pitmasters with AGI, Roboerta remained Teddy and Donna’s discreet secret. Donna kissed and held up their Magic Hickory Nut during the celebration on stage. Welcome to Barbecue in the Fourth Age! First, some background. 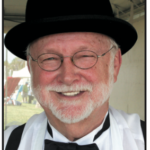 Futurist Byron Reese and others have raised some cultural and scientific issues that will impact the current and future barbecue contest, restaurant and outdoor cooking scene. 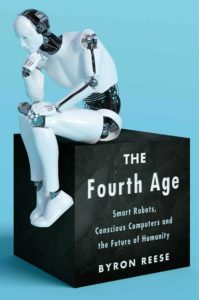 In his new book, The Fourth Age: Smart Robots, Conscious Computers and the Future of Humanity, Reese maps human development from early times to present in four major ages. 4. Smart Robots and Conscious Computers. Popular culture is inundated with sci-fi stories and movies featuring robots with Artificial Intelligence (AI) capable of interacting with humans. Most, like R2-D2, bear no resemblance to human beings in voice or appearance. Same goes for the robotic devices we are using in our daily lives. Industrial robots assemble vehicles, electronics, and virtually every other product that used to be produced on assembly lines staffed by humans. Lately we’ve been hearing predictions that by no later than 2030, 40% or more of today’s jobs will be done by robots instead of humans. Robotic technology in the barbecue scene has the potential to increase exponentially. AI is literally a no-brainer. It harnesses massive amounts of data and applies it in response to your commands. Smart cooking and temperature control/monitoring devices are already common barbecue helpers at contests, in restaurants and in backyards. Much more barbecue technology is on the horizon. Reese and other futurists, as far as I know, haven’t addressed the impact of AI on barbecue, but their discussions of robots with Artificial General Intelligence (AGI) that exceeds human intelligence has direct relevance to the future of barbecue. Robots with AGI can make radical changes in the barbecue restaurant industry as well as making barbecue and grilling contests irrelevant. Why bother with contests when robots with AGI can outperform the greatest human pitmasters on the planet? In the interim, why bother with human barbecue judges when robots with AGI can master every aspect of judging excellent Appearance, Tenderness and Taste, rendering consistent judging results every time without fail? I like to think that the future of barbecue will never come to that. Robots can’t love, be happy and have fun—and that’s what barbecue is all about! Robots can make our lives easier, but they can’t replace us. Be kind, generous, and full of love. Happy Valentine’s Day!